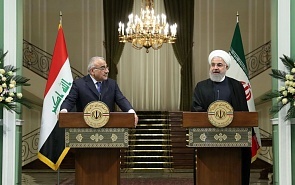 For the first time since assuming office in October 2018, Iraqi Prime Minister Adel Abdul-Mahdi paid an official visit to Tehran on April 6-7 at the formal invitation of Iranian President Hassan Rouhani. Abdul-Mahdi’s visit to Tehran came at the same time as the administration of US President Donald Trump is actively trying to cut Iran’s ties with its political and economic partners, as a part of its strategy of “maximizing pressures” on the Islamic Republic. In this vein, as the temporary sanctions waivers issued by Washington for a number of Iran’s energy costumers are coming to an end, the US has doubled on its pressures on those countries to cut their ties with Tehran or face harsh penalties. Currently, over 30 percent of Iraq’s electricity needs is imported from Iran. Although the US recently extended Baghdad’s waiver for continuing to buy electricity from Iran for a 90-day period, Iraqi officials say it’s impossible to cut the imports within this period and the country needs at least three years to reach self-sufficiency in this field. At the same time, the Iraqi prime minister has made it clear that his administration does not abide by the unilateral American sanctions against the Islamic Republic. In fact, not only the Iraqi government continues its electricity imports from Iran, but the two sides have been also busy devising plans for minimizing the effects of the US sanctions on their economic ties, including the use of local currencies for conducting trade. At the same time, the extent and nature of recent agreements between the two sides, covering a wide range from connecting their rail systems to expanding the volume of bilateral trade to $20 billion in the near future, represent a great failure for Washington’s anti-Iran campaign. Meanwhile, to change Iraq’s course regarding Iran and impede the development of ties between the two countries, Washington faces two main challenges. On the one hand, Iran’s strong influence within many powerful political factions in Iraq, especially the Shiite groups, makes it very hard – if not impossible – for any Iraqi administration to revise the country’s close ties with Iran, even if it decides to so. On the other hand, although the ISIS terrorist group has been effectively defeated and deprived from the territories it had under control in Iraq, the security situation in the country is still fragile and any excessive political or economic pressures on the Iraqi government would result in the reemergence of radical movements or a new wave of instability. This factor puts serious strains on the US sanctions policy, as the potential instability resulting from sanctioning Iraq would come back to haunt Washington and put its own regional interests at risk. However, it’s worth mentioning that contrary to what most of the American officials, as well as some analysts tend to argue, the current status of Iranian-Iraqi relations does not imply to a kind of ideological “Shiite Axis” in the making as part of an Iranian master plan to dominate the region or face its Sunni Arab rivals. By contrast, Tehran’s approach toward expanding relations with Baghdad has more to do with satisfying economic interests at the time of sanctions than with pursuing an ideological or hegemonic agenda. In other words, one of the main approaches devised by the Iranian government to deal with the negative effects of the US sanctions, is to develop economic ties with the neighbors, and such a tendency has been quite visible in the activation of Tehran’s foreign policy all around its neighborhood, from Russia to Azerbaijan and from Armenia to Iraq. In fact, not only Iran itself is not seeking to form an ideological axis with the participation of Iraq, Baghdad’s current foreign policy approach does not allow such a development in the first place. Under Abdul-Mahdi, Iraq tries to initiate favorable relations with all regional states, including Iran’s arch-rival Saudi Arabia. Indeed, although Saudi Arabia’s recent charm offensive toward Iraq, reflected in such moves as signing huge economic agreements with Baghdad or granting financial “gifts” are derived mostly from Riyadh’s aim to counter the Iranian influence in this Arab country, the Iraqi administration has shown enough cleverness not to lean toward this or that side of the regional rivalry and instead, it tries to achieve the most from maintaining friendly relations with both countries and pursuing a balanced foreign policy. Such a trend in the Iraqi foreign policy would not only bring positive results for Iraq’s stability and the prospects of its economic prosperity, but could also serve the interests of a number of other actors, including Russia. That’s because, as the main element of its Middle East policy, Moscow has always tried to establish good relations with all the countries of the region, while showing great interest toward preserving the regional balance of power and preventing any clashes between competing regional powers. As such, the current trend in relations between Iran and Iraq seems to have Russia’s support as well.